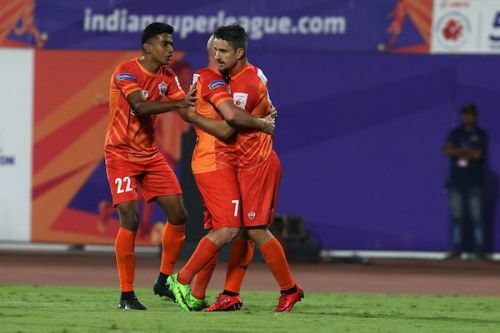 FC Pune City recorded their second win in as many ISL games as they upstaged FC Goa by a scoreline of 2-0 at the Balewadi Stadium. A jaw-dropping goal from Marcelinho and a 94th-minute penalty from super sub Stankovic put the game beyond Sergio Lobera's side, who could slip outside the Top 4 if Jamshedpur FC take away all three points against a hapless Delhi Dynamos FC. The first half didn't see too much from either side, but the fixture opened up in the later stages of the second half, with both teams going for all three points. The visitors dominated possession and racked up more passes, but lack of conviction in front of goal and a slice of fortune for the opposition led to their second defeat in three games. Here are the five major talking points from FC Pune City's 2-0 victory over FC Goa. Right from the outset, FC Goa began to showcase their attacking flair and firepower. In the very first minute, through their first attack, they won a corner. Coro got his shot away but was blocked by a packed Pune defence. The hosts meanwhile, looked out of steam and lost the ball in advanced positions in the early exchanges. Ashique Kuruniyan was dispossessed early on while trying to take on the opposition fullback, and that was arguably FC Pune City's only chance in the first 10-15 minutes or so. Adil Khan got the home fans off their seat, as his cross came through everyone to the path of Robin Singh, who was a little bit static. The biggest chance for Pune though, came when Hume spotted an opening and split a high Goa defence with a long ball. Marcelinho was at the end of the ball, but Seriton Fernandes' heroic sliding challenge prevented a certain goal. Meanwhile, in his follow-through, Marcelinho stamped Mohammad Nawaz. Moments later, Robin Singh won the ball high up the pitch, played it through to Hume, who set it up for Jonathan Vila. The latter's fierce shot though was blocked. Brandon struck a couple of fine shots at goal but was denied by an outstanding Kamaljit Singh. Mandar Desai and himself threatened big from the left-hand side. Pune on the other hand, looked slow, defensively flattened and sluggish.